I can still see the bag, and the books. When I was a kid….say in the early 1970’s, there were drawers in the “credenza” aka dining room side buffet, that were filled with S&H Green Stamps, and the books they needed to be posted in. 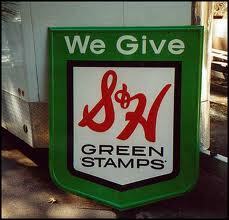 S&H Green Stamps were “trading stamps,” used as the basis for a rewards program. Each time you went to a certain market, or filled up with gas at your local filling station, you were given rows of green stamps. The idea was you took the stamps, and pasted them in the given books, and you could “cash in ” the books for rewards; kitchen aids, bedding, clothes ect. In the 1960’s, the rewards catalog was the largest printed publication in the United States. For the record, I despised the whole idea of those trading stamps. Long before there was an episode on Seinfeld about a woman who died from licking too many envelopes; I would claim to my brothers and sisters that I couldn’t be blamed for any mental lapses of judgment on my part as I was suffering from DSLS; Delayed Stamp Licking Syndrome, a condition I diagnosed while in the D.W.D program (Doctors Without Degrees……….fictional…….hello??) Even though my mother would set us up with a sponge, and bowl of water, I can still taste those stamps. As you may suspect, it seems years of our lives were wasted on filling those books; even though it may have been only 20 minutes, and I don’t ever recall getting one thing from the catalog……..EVER!!! If I am at my sister’s house and looking at that cadenzas, I want to pop open the door (with a knife because one of the handles were always broken) and see if that large bag of ……..stamps (it hurt to say) is still there. To this day, even though I have “gas points,” and “frequent flyer mileage,” just the word “rewards” makes me cringe. Face it, I may get a free flight to San Francisco, but there is no way they are going to deliver that red, Schwinn, 3 speed bike I always wanted regardless of the “glue headache’ I’m fighting back right now! I do not remember green stamps because I was born in the late 70’s, but box tops kind of are annoying as well. Also, the whole couponing mania seems a bit overblown, especially since now here in California you are limited to using three coupons per visit, so not sure how those extreme coupons can get a whole shopping cart full of stuff for three dollars. I understand being annoyed by those. I sort of feel the same way about extreme couponing. Who needs a room full of detergent, anyway?